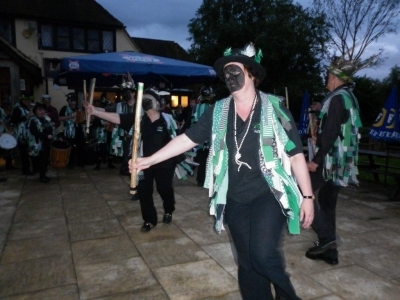 What is Lynda doing with that stick? 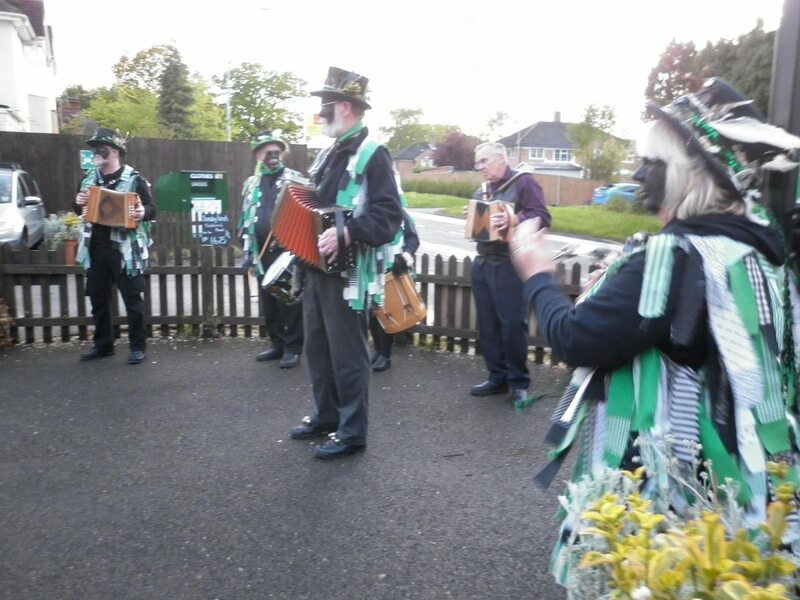 The evenings dancing ended with a customary "East Acton"
On a glorious warm evening - ideal for standing around, chatting and playing music all evening. 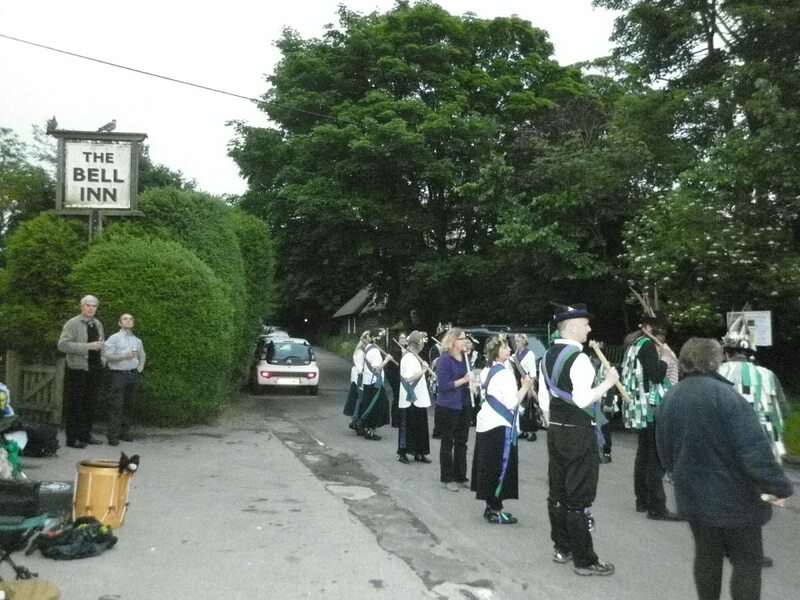 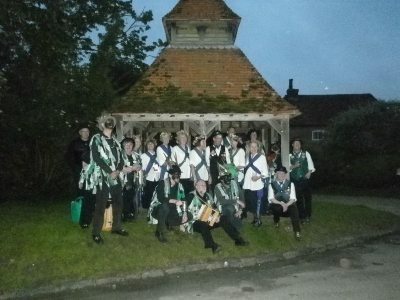 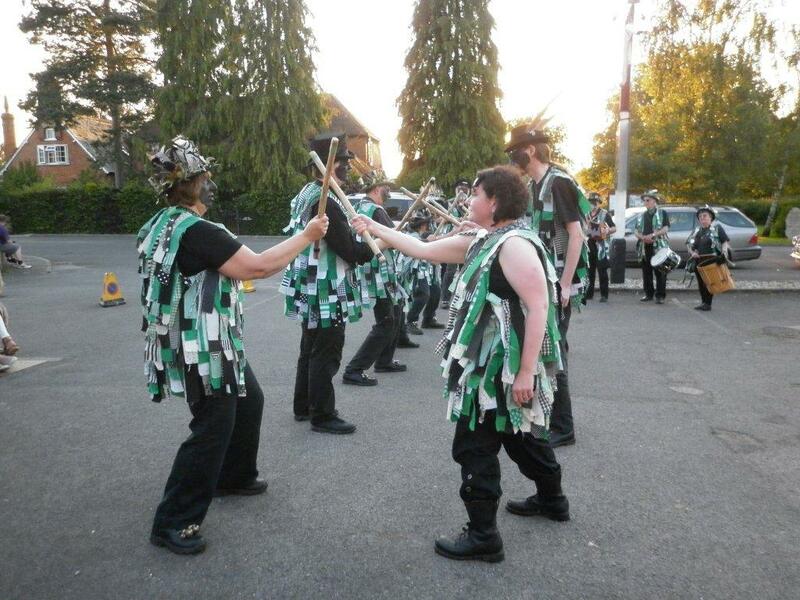 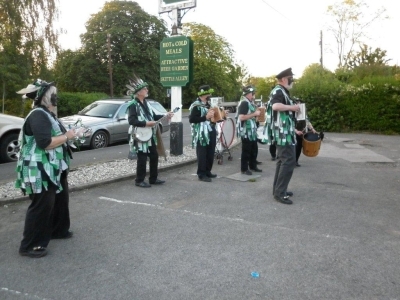 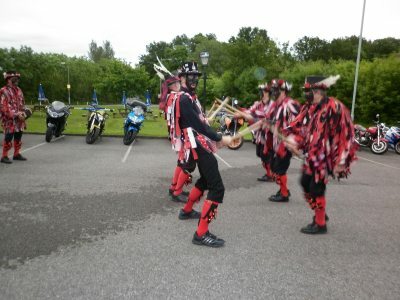 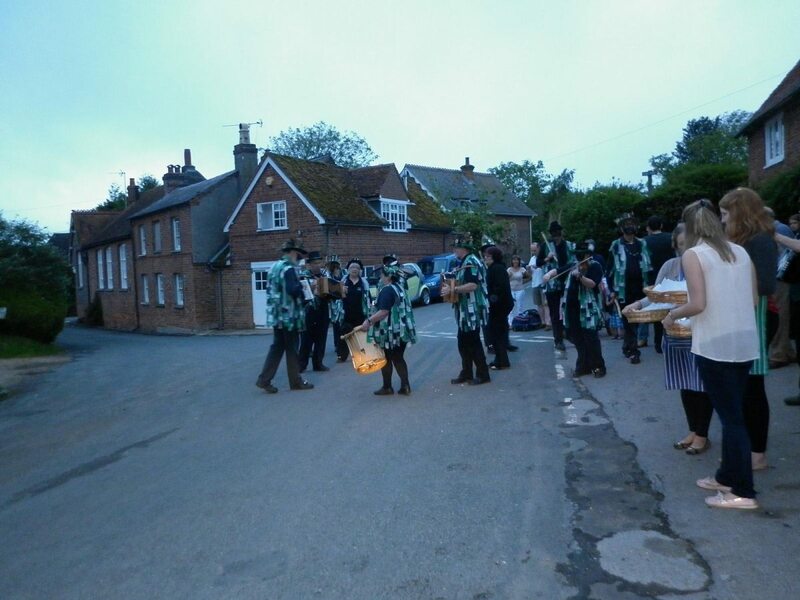 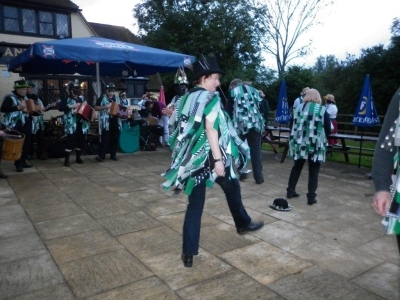 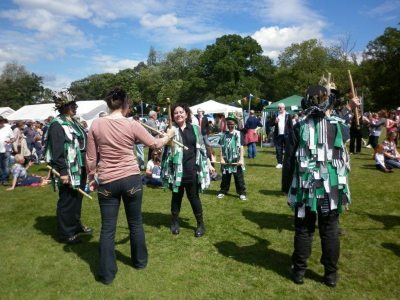 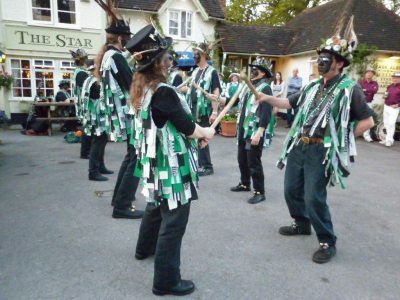 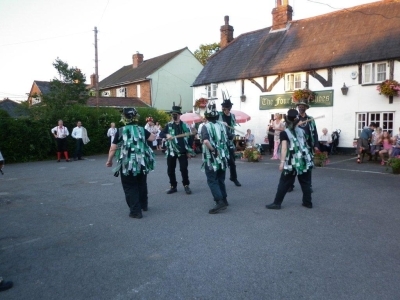 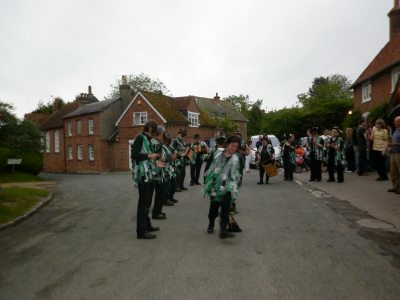 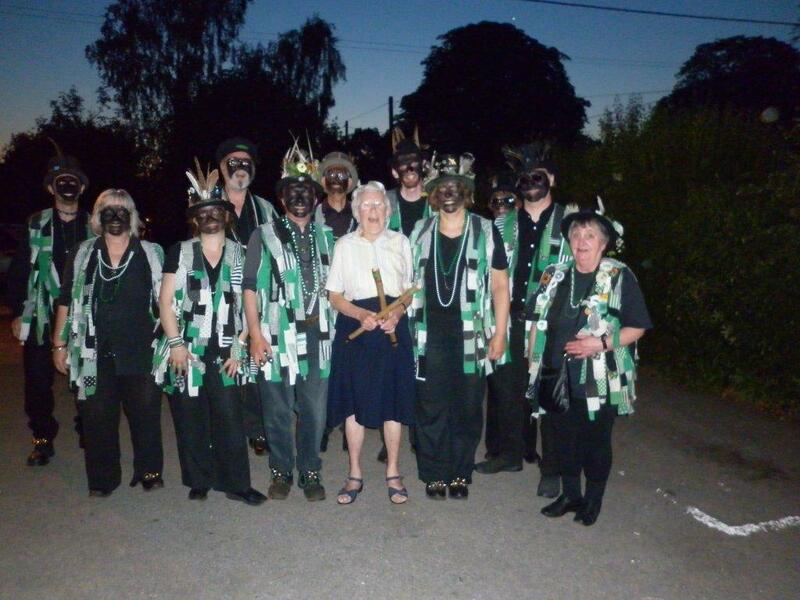 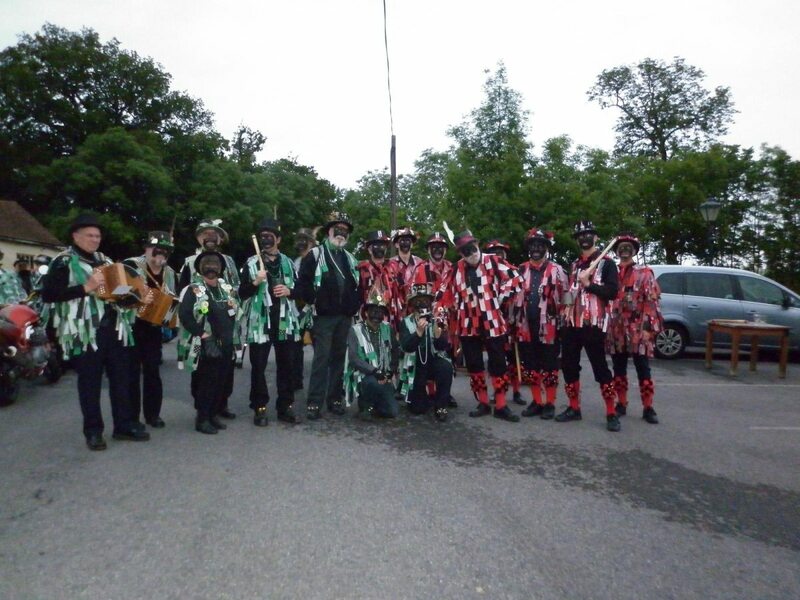 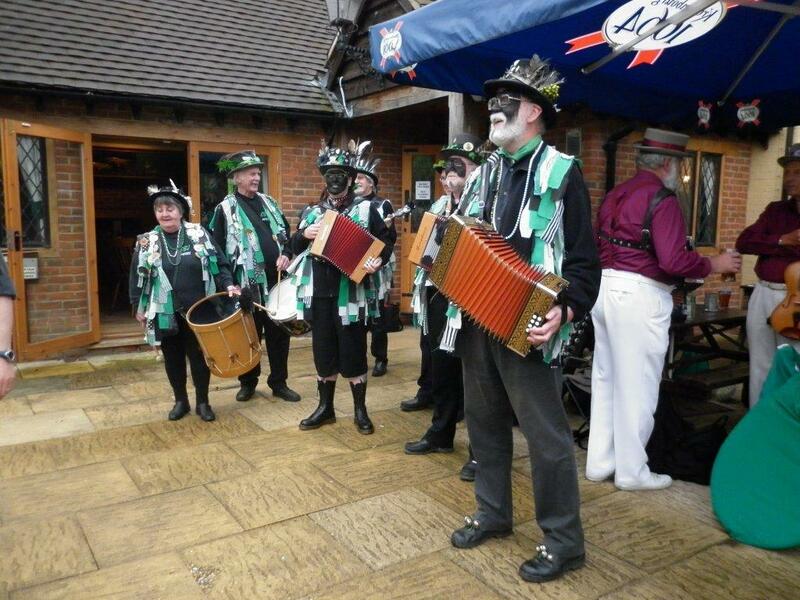 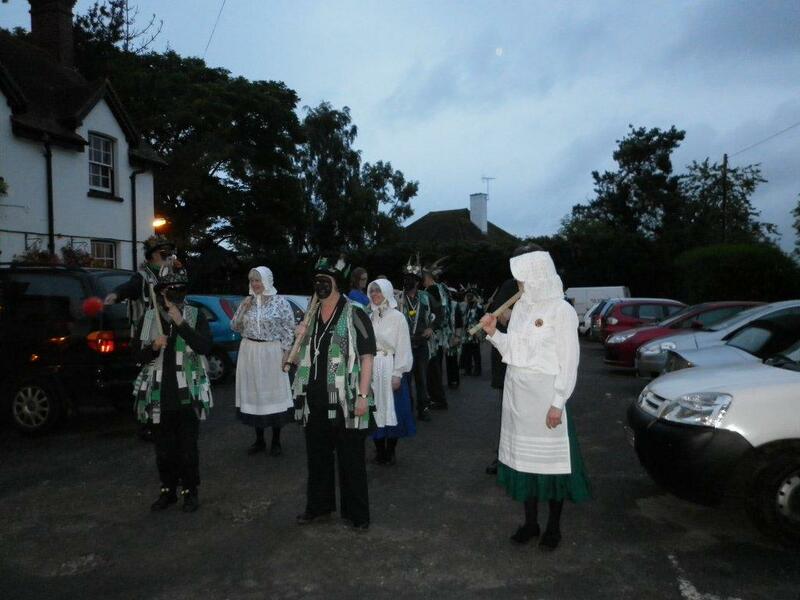 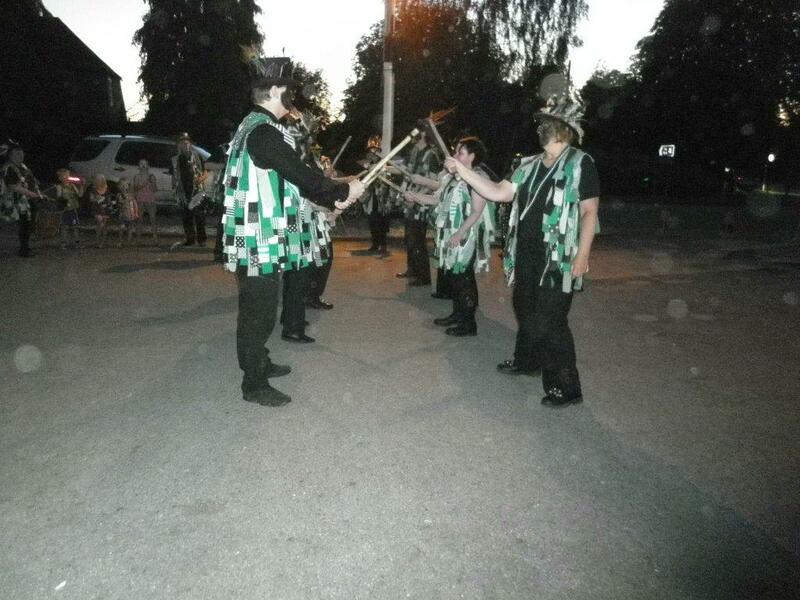 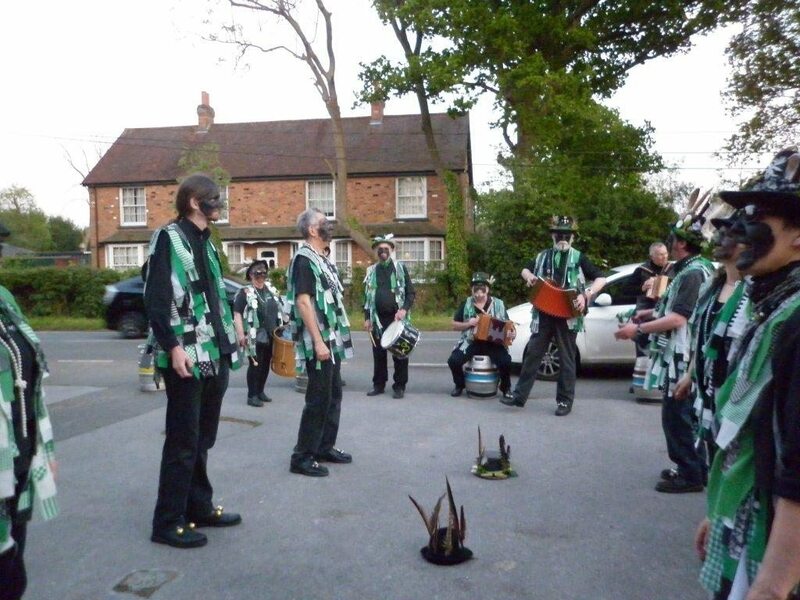 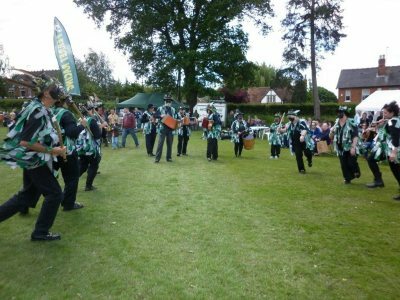 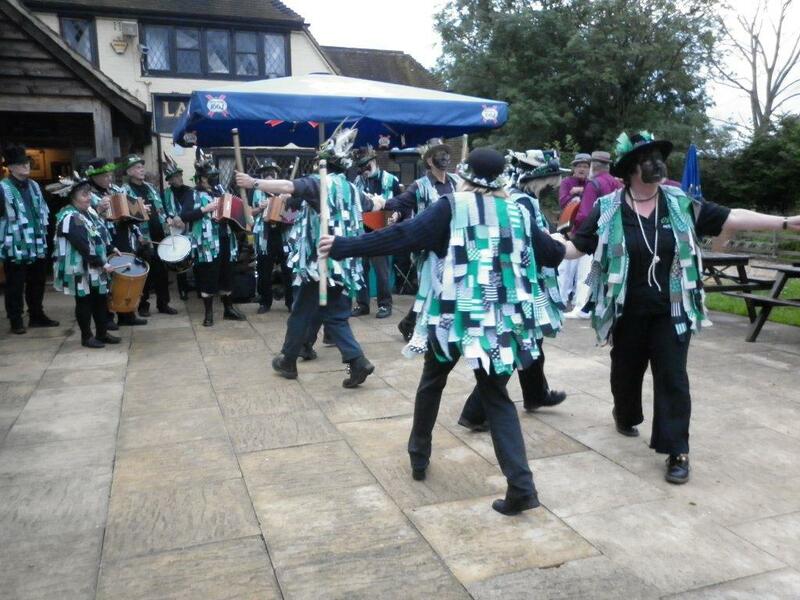 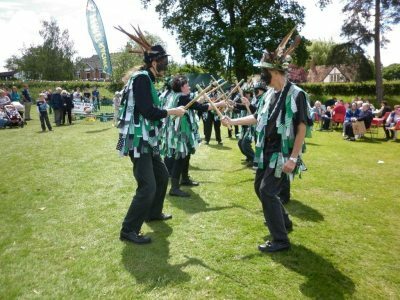 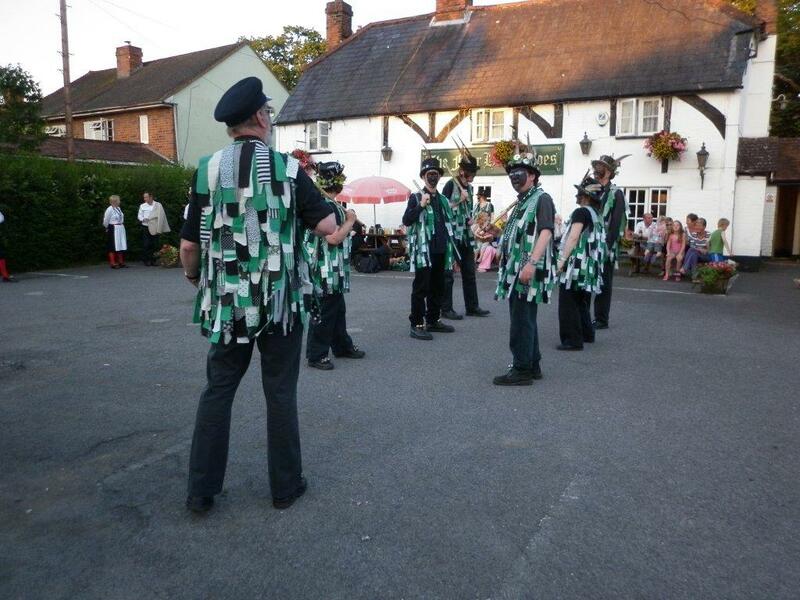 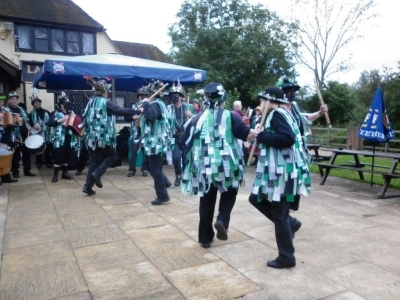 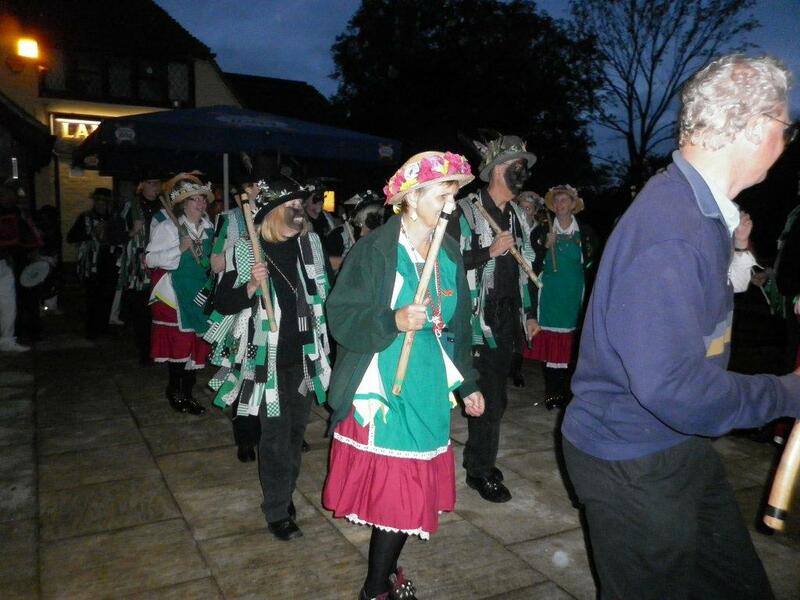 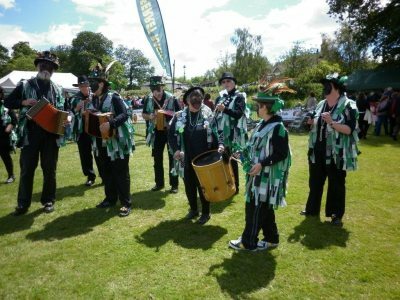 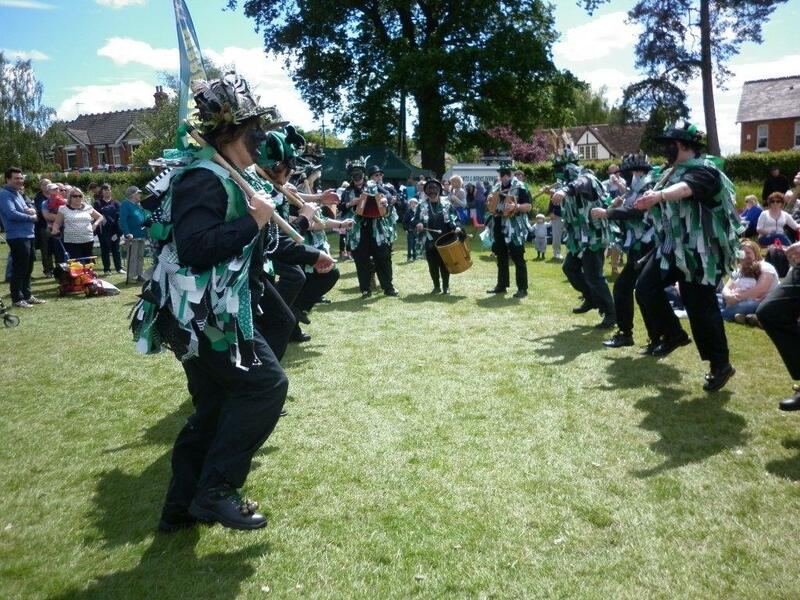 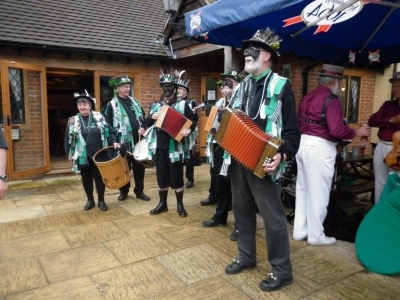 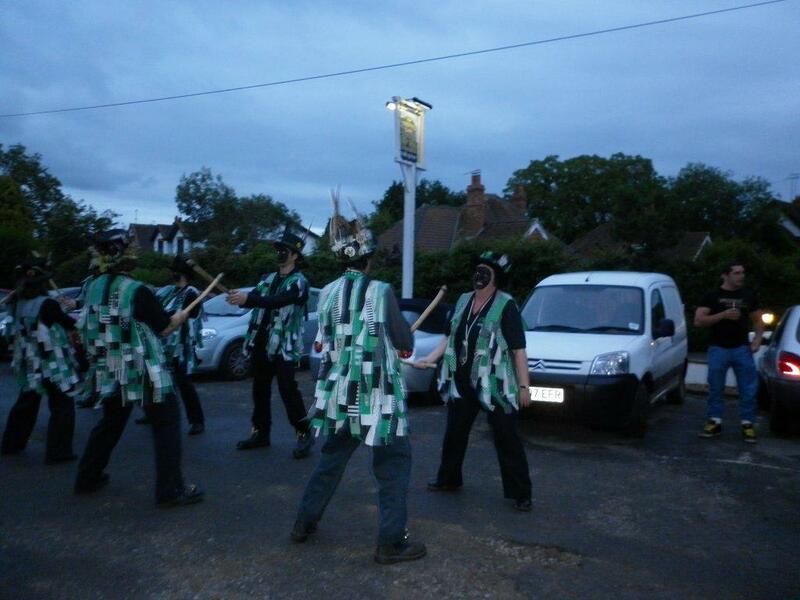 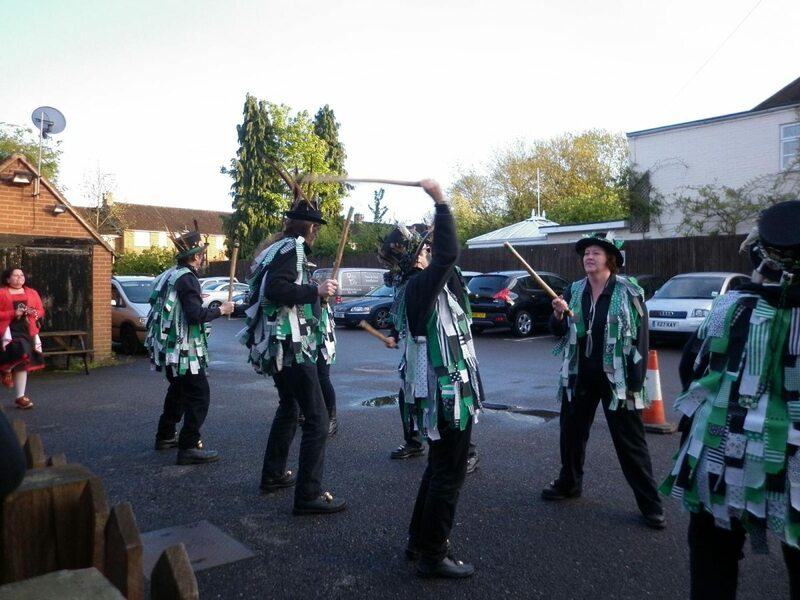 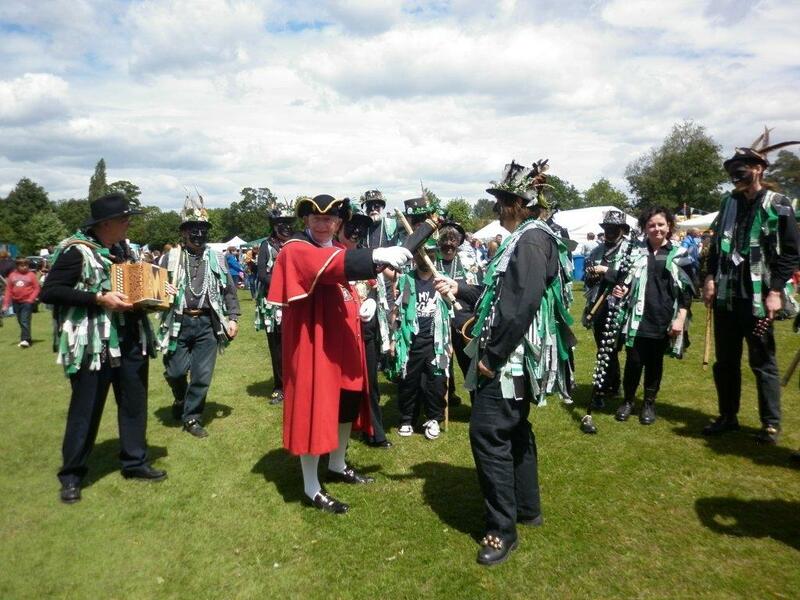 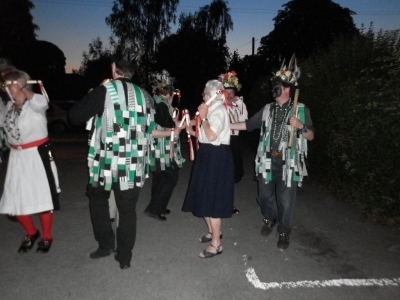 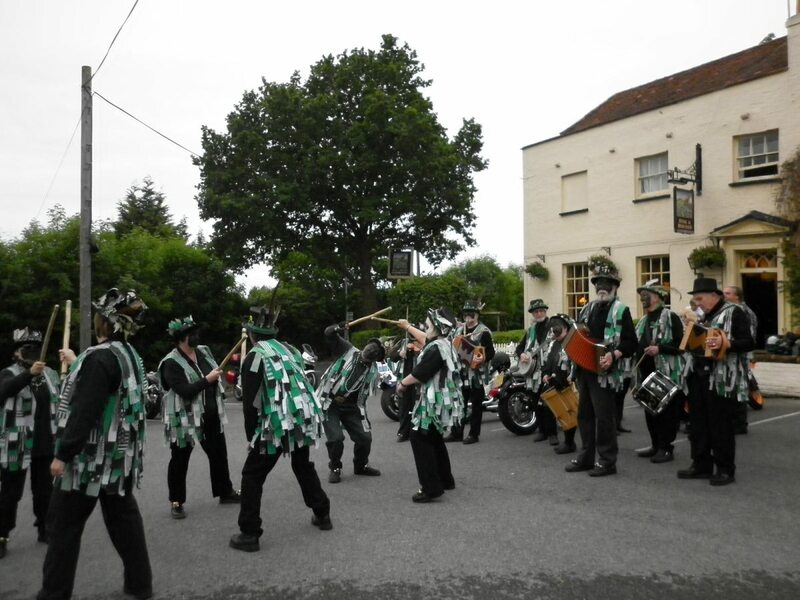 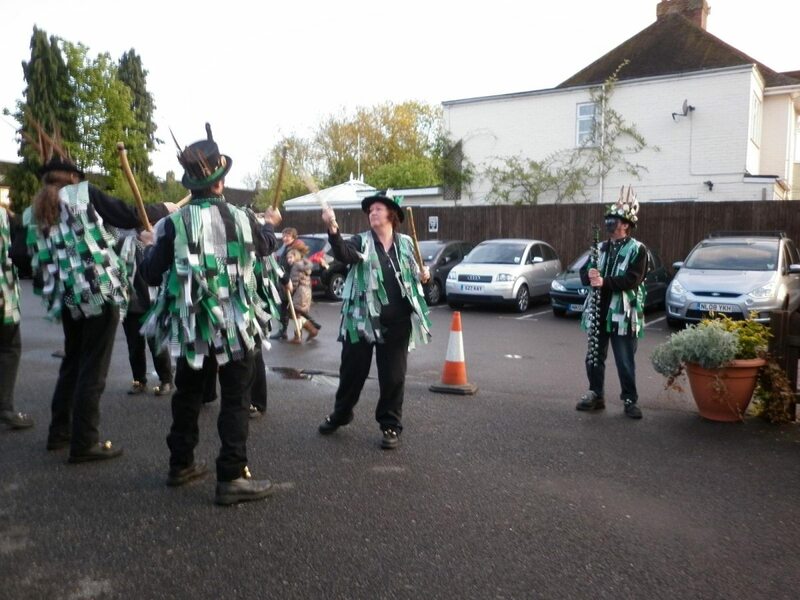 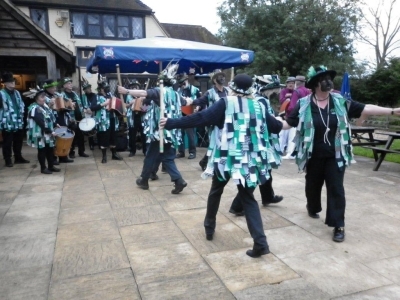 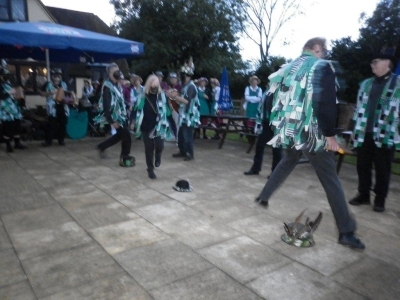 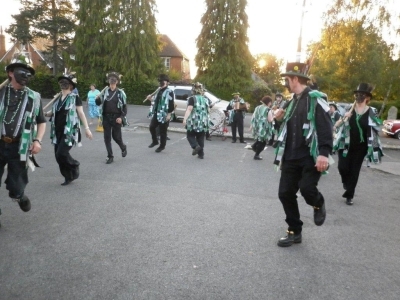 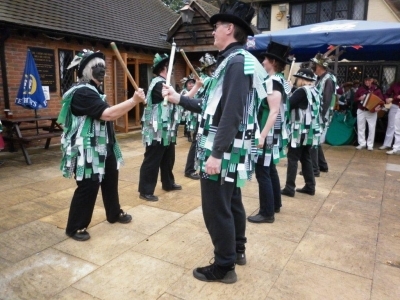 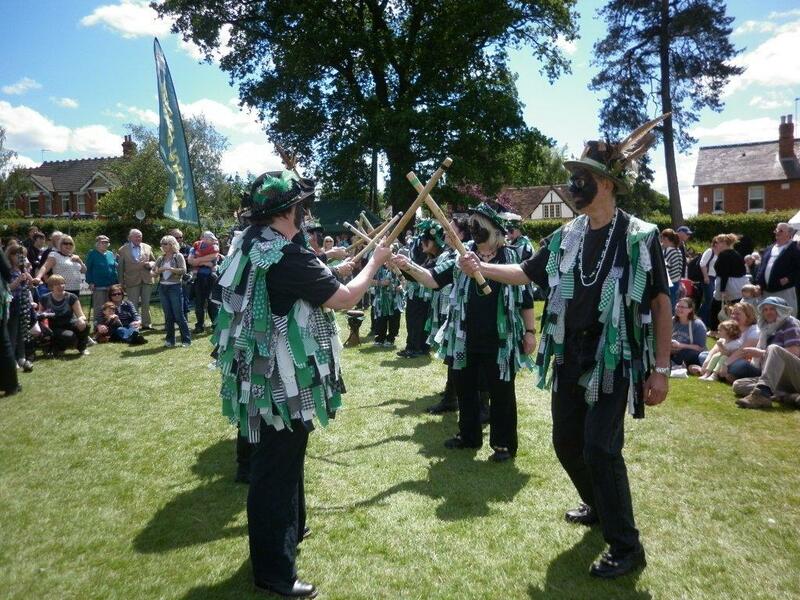 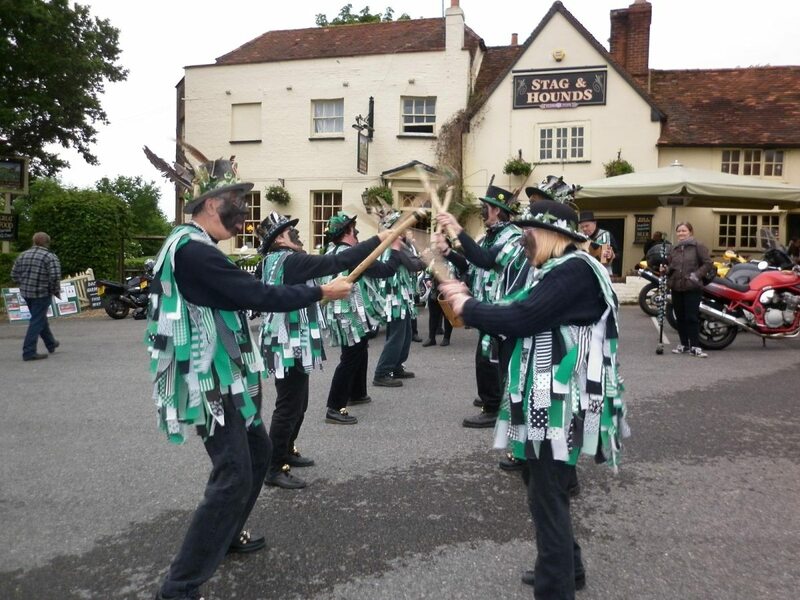 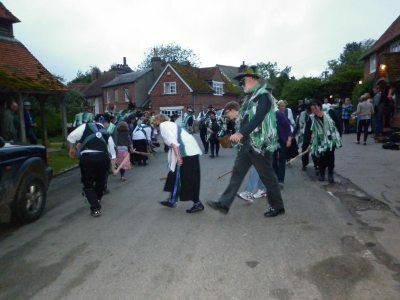 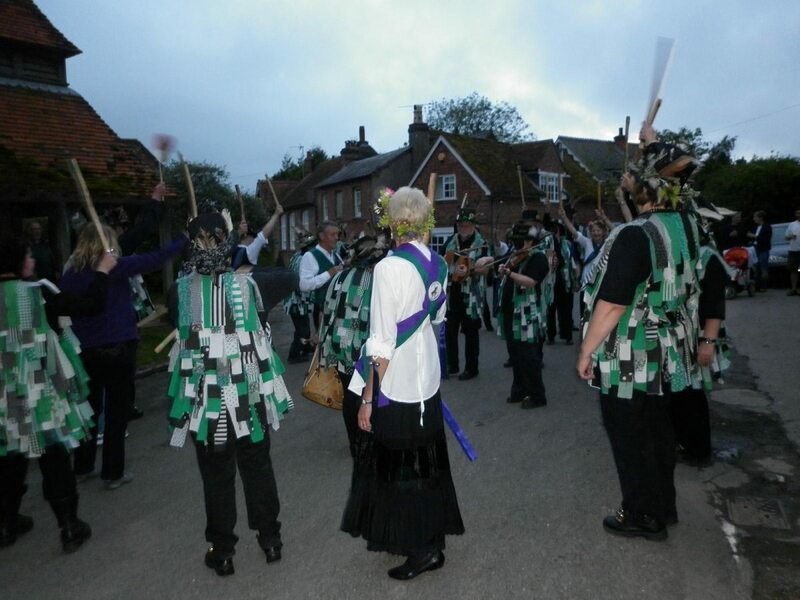 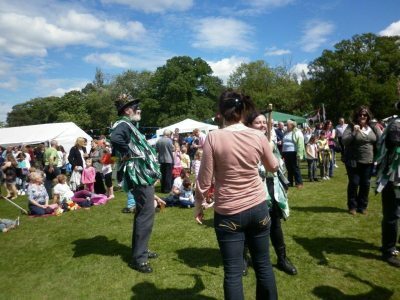 The landlord did us proud - he was new to the pub and had been handed a diary that apparently said "800 Morris Dancers". 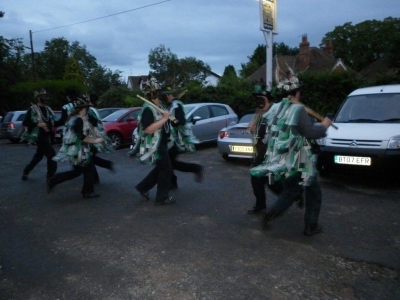 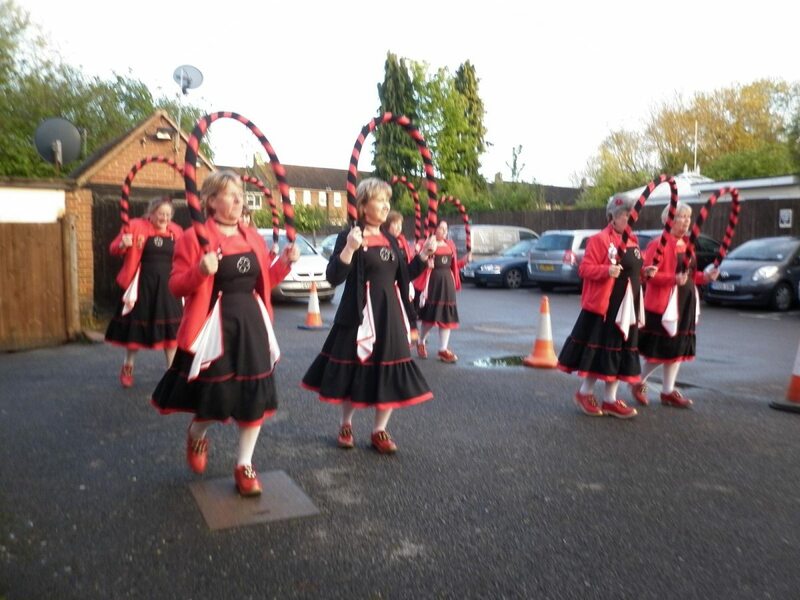 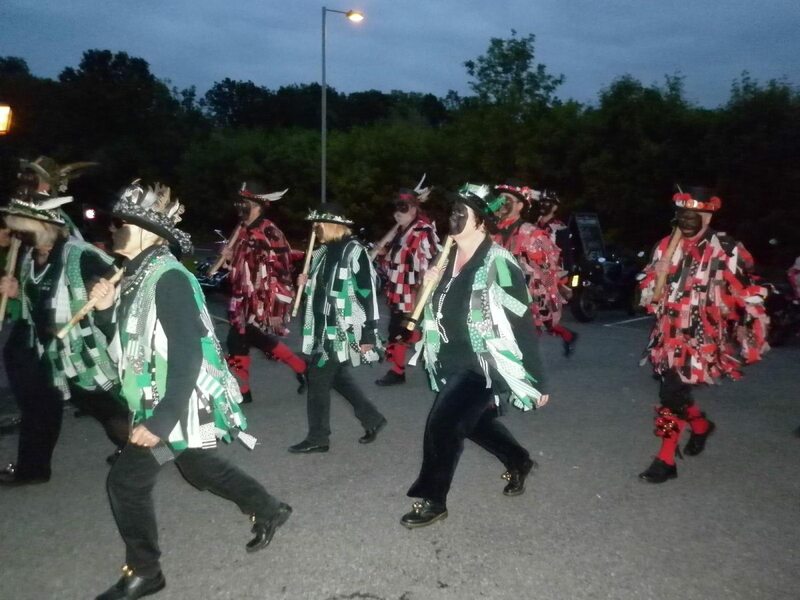 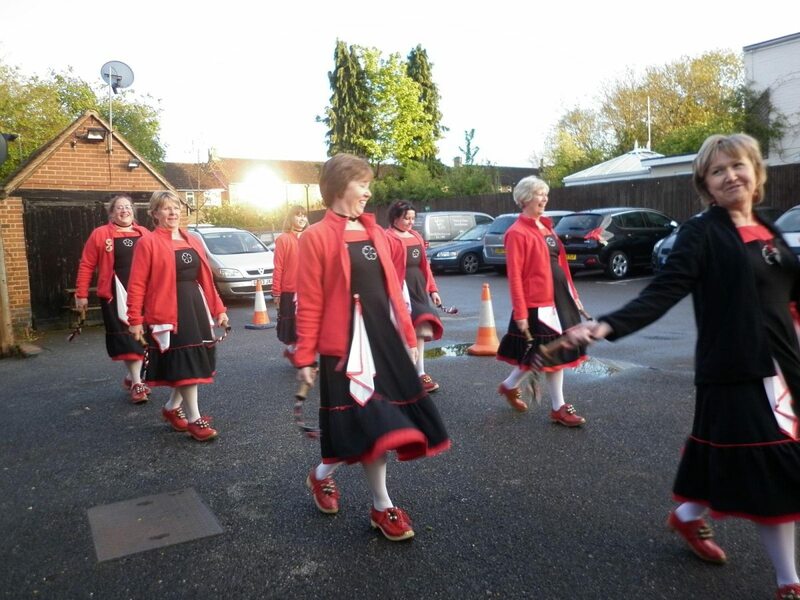 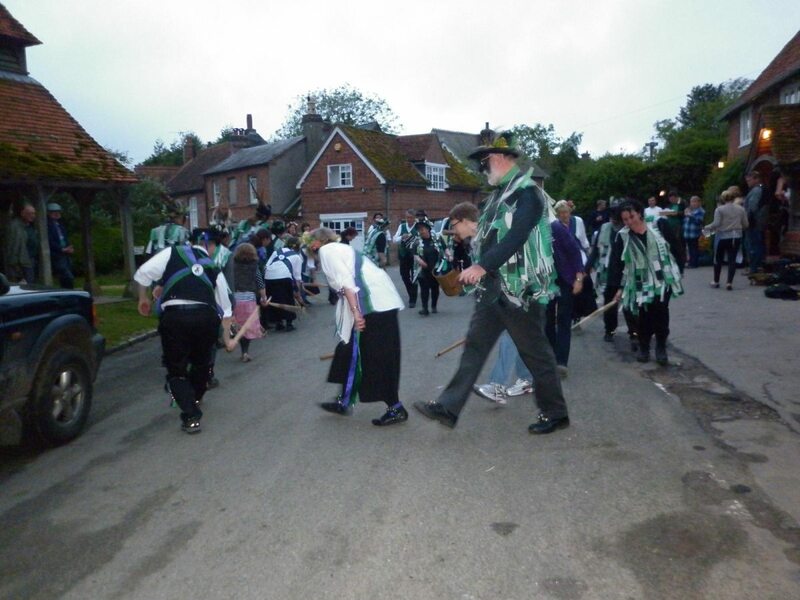 It turned out that it really said 8.00 Morris Dancers - a bit more manageable. OBJ and some of the audience look on. 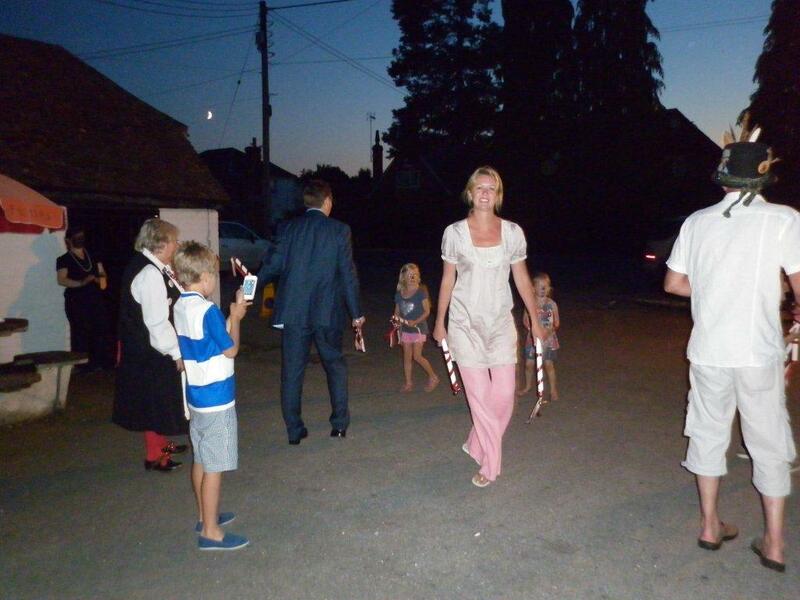 Clare, Ian, Liz? 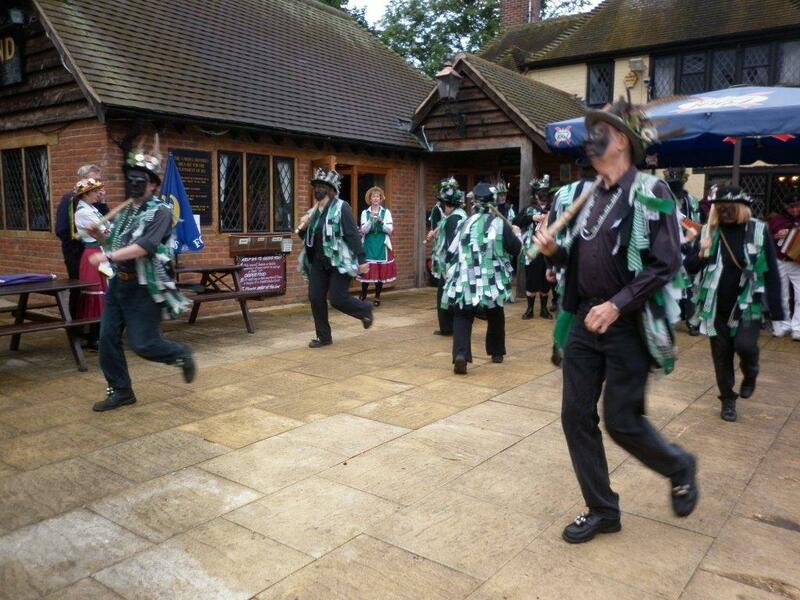 and Chris on the left. 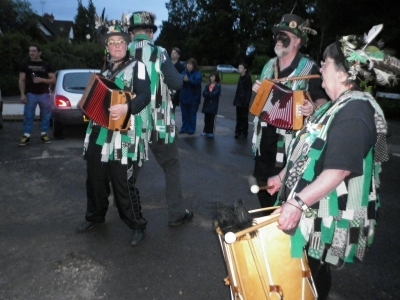 Eddie, Lynda, Mike G and Philip on the right. Ian and Mike G on the left . 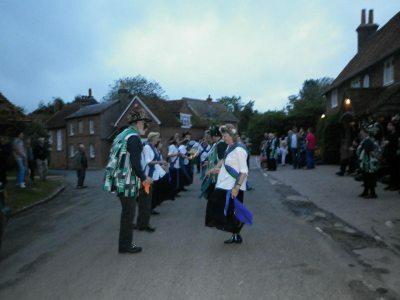 Lynda, Ann and Eddie on the right. 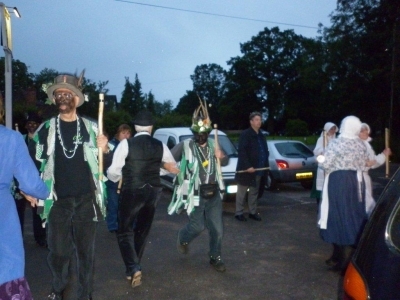 This has been a regular event for OBJ for several years. Looks like the same dance to me! This may be another Dilwyn, from the second set. Colin calling (yelling) above the din! 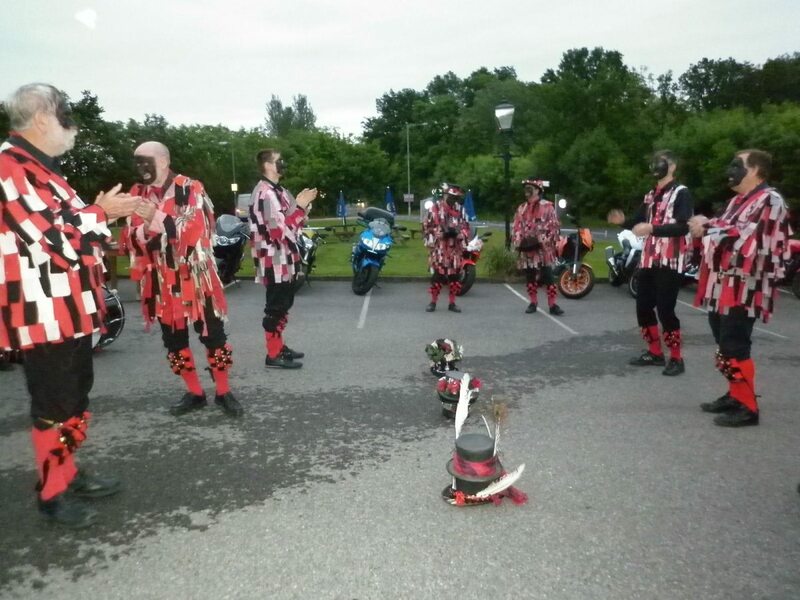 We arrived to find the car park full of motor-bikes and bikers - turned out they meet regularly at the Stag&Hounds on Tuesday evenings. 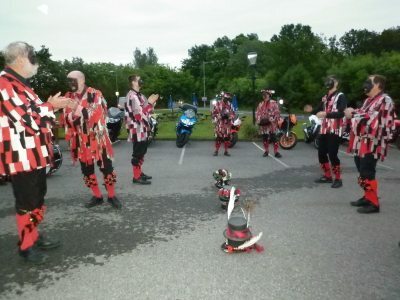 They had a barbeque going and were fund-raising for Air Ambulance. 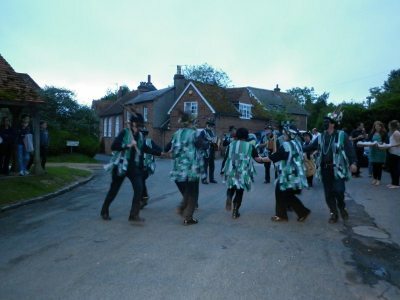 Definitely dark now - time for the last dance. 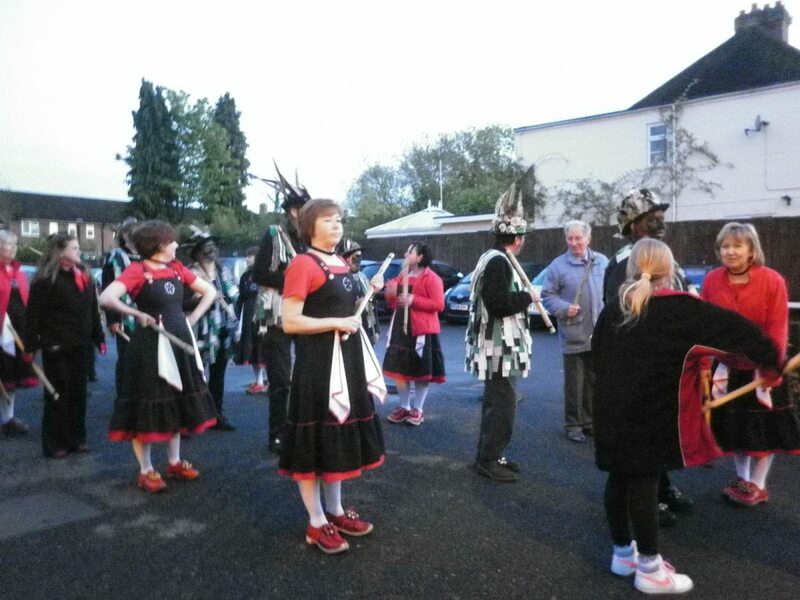 All up for an East Acton to finish. Probably - no definitely - the best pub in Berkshire. The landlord and his team were, as always, charming. 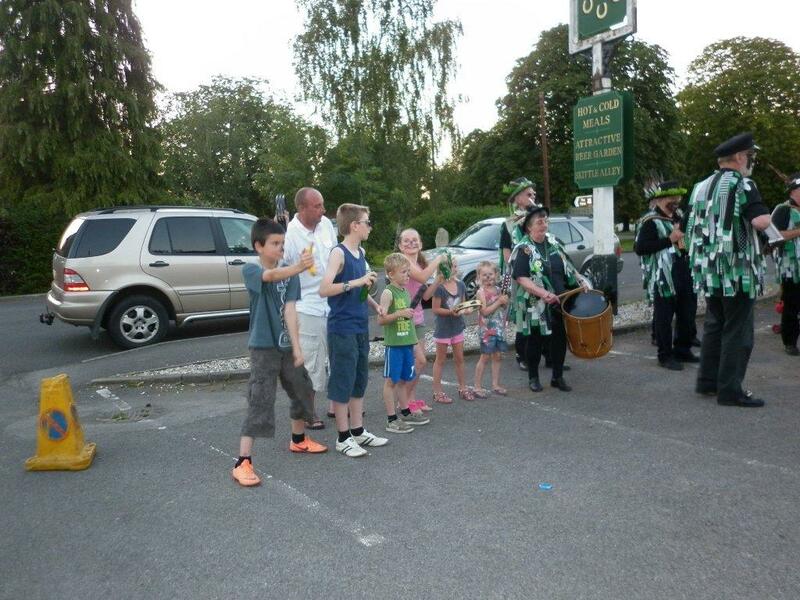 There was a good crowd to watch us, including some familiar faces. 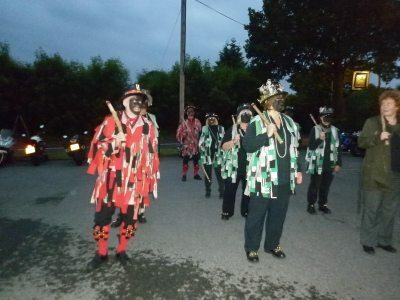 Garston Gallopers were excellent company for the evening. 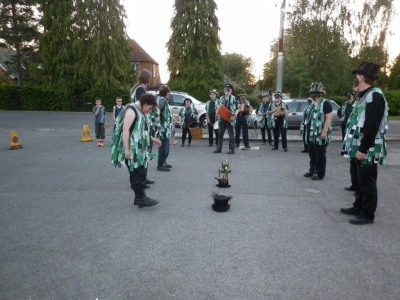 During a lull in proceedings Alan presented us with a gorgeous wassail bowl that he'd made following our wassail in January. 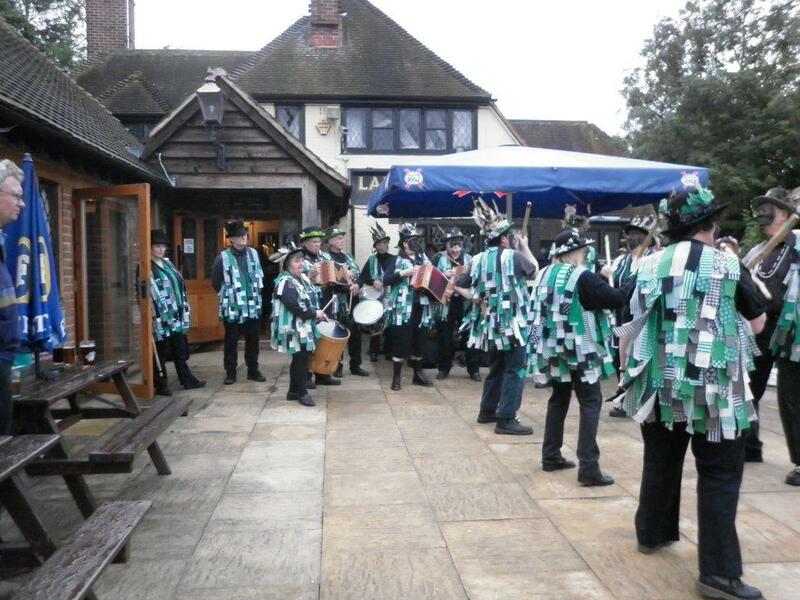 The pub team have come out to offer us sustenace. They are lovely! 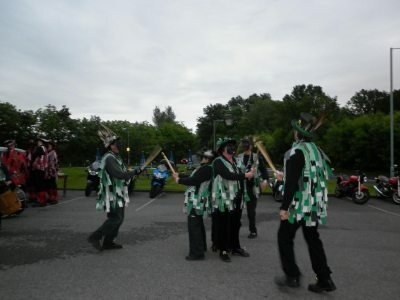 Another joining-in dance - I think it was Shepherd's Hey or something similar. 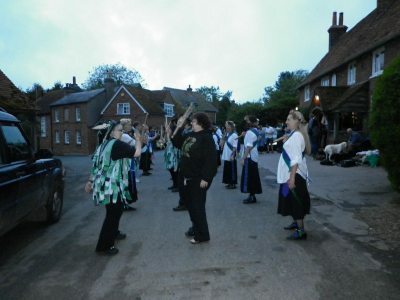 Possibly their first times in kit - but not yet blacked-up. 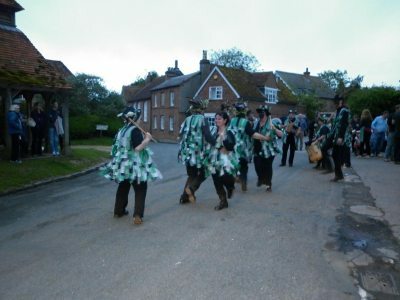 Tony and Claudia are on the right. Chris, Philip, Eddie and Ann are visible in the gloom! 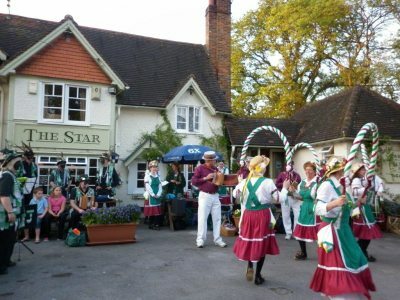 "Cast" is called with a northern accent to avoid confusion with "stars"